I’ve been a big fan of mindmapping software ever since I came across FreeMind, a fast and free mindmapping tool. XMind became my new favourite when I found out about it. 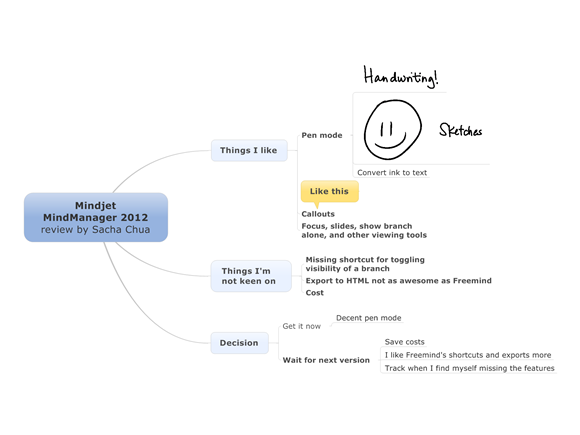 I wanted to give the premium mindmapping programs a try, though, so I gave iMindMap and MindManager a spin. iMindMap was colourful, but didn’t quite fit the way I wanted to work. It’s definitely skewed towards maps with just one word on the branches, and I tend to write whatever I want to. MindManager fit me better. I was delighted to find that MindManager had a good pen mode, allowing me to create, edit, and organize my map with my computer in tablet mode (look, Ma, no keyboard!). I could scribble things down, then convert ink to text and have fully-searchable and more legible notes afterwards. I tried using MindManager in pen mode to capture a panel discussion. This was a bit of a challenge as I was actually on the panel in question, but I wanted to take notes anyway. I probably wouldn’t have tried this with other (non-tablet) mindmapping programs because the keyboard clicking sounds would have been distracting even if I had my screen tilted down (removing a barrier between me and others). The smooth gliding of a pen across a tablet screen is unobtrusive, and not all that different from writing on (somewhat glowy) paper. As it turned out, the necessity of writing in the input box caused a bit more mental friction than drawing on a blank canvas in Autodesk Sketchbook Pro. (The input box size is configurable, but there are tradeoffs as you have to make your gestures outside the box.) I also ended up redoing the whole summary in Sketchbook because I wanted it to have more personality and a more compact layout. So no time savings for real-time visual notetaking, at least for me, although it was good to be able to reorganize points as needed. I’ve also been using MindManager for keyboard-based brainstorming. It has a number of nifty features for project management and map navigation, but I haven’t made them part of the way I work. MindManager’s handwriting recognition and pen controls are high on coolness factor and they’re pleasant to use, but considering that I can get the other features I care about for free with XMind, I’m not particularly keen on the $399 price for MindManager. Might be a good fit for other people, but I’ll hold off getting it for now. Still, good to know what’s out there!